Iodine is an essential element in human physiology. Its role in thyroid function is well known and heavily weighted in the literature. Its putative role as an anticarcinogenic agent is just beginning to be widely appreciated. The molecular effects of iodine as well as ongoing epidemiological evidence points to its probable role in prevention of cancers through its antioxidant, antiinflammatory, prodifferentiating, and proapoptotic effects. This is particularly evident with stomach and breast cancers but may be relevant for many other cancers that have yet to be substantially studied. The first report of geographical regions with high rates of goiter having higher rates of cancer mortality was published in 1924.1,2 Ongoing epidemiological data has corroborated the association between goitrogenous regions and cancer incidence/mortality, particularly that of stomach cancer.3,4 Epidemiological evidence also suggests that thyroid disorders, particularly goiter, may be associated with breast cancer incidence and/or mortality.5�C8 Other cancers associated with goitrogenic state include prostate cancer, endometrial, ovarian, colorectal, and thyroid cancer. It is not clear whether these associations are due to an underlying hypothyroid state, the presence of occult autoimmune processes, or iodine deficiency itself.9 Ultimately, the etiology of all cancers is multifactorial, with benefit assumed in the reduction of modifiable risk factors. There is substantial evidence that iodine deficiency is a modifiable risk factor in cancers of the stomach and breast and possibly many other organs. This review will outline evidence on iodine as an independent influence in cancer development and/or progression. 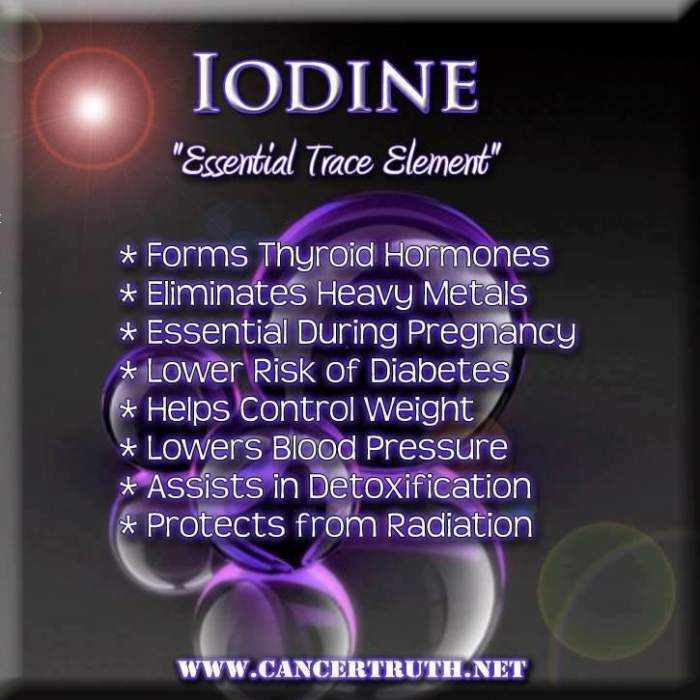 Total iodine content of the body is estimated at 25 mg to 50 mg, with 50%�C70% of that found in extrathyroidal tissues.10 Systemic absorption of iodine takes place in the small intestine, where it is absorbed and transported into the bloodstream primarily as iodide (I-). Ultimately, excretion is via the kidneys with a minor amounts excreted in feces. Ultimately, the etiology of all cancers is multifactorial with benefit assumed in the reduction of modifiable risk factors. There is substantial evidence that iodine deficiency is a modifiable risk factor in cancers of the stomach and breast. While NIS allows for a high concentration of intracellular iodine in specific tissues mentioned above, iodine is believed to be in every tissue of the body.18 As early as 1961, the ubiquitous distribution of radiolabelled iodide was noted on full body imaging.19 Emerging research is showing that other receptors (such as pendrin and apical NIS) may be important in the uptake of iodine into various tissues.20 In addition, iodine is liberated intracellularly when thyroxine (T4) is converted to triiodothyronine (T3), a process requiring the selenium dependent enzyme deiodinase. Iodine has been proposed as a primitive antioxidant, with algae having an effective and perhaps necessary evolutionary role in squelching free radicals from the atmosphere.21 In humans, iodide has been shown to favorably affect serum antioxidant status.22 Iodide may be acting directly as an electron donor, squelching free radicals such as hydroxyl radicals. It may also be acting indirectly through iodination of amino acids (ie, tyrosine and histidine) or fatty acids (arachadonic acid), rendering them less likely to be oxidized themselves.23 In an experiment to determine antioxidant capacity (ferrous reducing/antioxidant power assay, FRAP), molecular iodine (I2) was 10 times more potent than ascorbic acid and 50 times more potent than potassium iodide (KI).24 It also appears to act with thiol redox systems, such as glutathione and thioredoxin, to maintain an optimal redox balance in cells. In the medical literature, the generalization of the term iodine can create confusion. The term iodine represents essentially any form of the molecule, including molecular iodine (I2), iodide salts (NaI or KI), iodate (NaIO), and/or lipids or proteins containing iodine (iodo) moieties such as iodotyrosine or iodolactones. The most well studied form is iodide salts, such as sodium iodide (NaI) and potassium iodide (KI), which are frequently used in supplementation of iodine to entire populations. Throughout this review the term iodine will be used as a general term, and specific forms given as a parenthetical descriptor whenever possible [eg, iodide (I-)]. Iodine's role in maintaining the health of breast tissue is suggested by its therapeutic effects on benign breast conditions. In a publication reviewing three clinical trials of varied designs, molecular iodine (I2) reduced fibrocystic signs/symptoms while iodide (I-) was less effective and affected thyroidal function more readily.34 In one of the trials included in that review, the dose of molecular iodine was 0.07 mg to 0.09 mg/kg body weight per day. Converting this to something more clinically useful, this is approximately 3.2 mg to 4.0 mg/100 lb body weight per day of molecular iodine (I2). In another study of 111 women with cyclic mastalgia, women took either 6 mg/day, 3 mg/day, or 1.5 mg/day of a combination iodide/iodate (I-/IO3-), or a placebo.35 Sodium iodate (NaIO3) was used with the prediction of dissolution in the stomach to molecular iodine (I2). In that study, more than 50% of the women taking 6 mg/day had a reduction in mastalgia symptoms at 6 months. How and whether 6-IL affects colon cancer cells is still not known. In a separate experiment, 6-IL was able to inhibit growth and induce apoptosis in colon cancer cell line (HT-29).66 Going forward, research should clarify which cancers are most affected by I2 and/or 6-IL. Historically, iodine's essential role in thyroid hormone formation and function has overshadowed its independent physiological effects. However, it is clear that iodine acts intracellularly as an antioxidant, prodifferentiating, antiinflammatory, and proapoptotic agent that is necessary for proper health and cellular renewal. Intracellular iodinases, more specifically called iodothyronine selenodeiodinases, are essential contributors to the pool of free iodine within cells.67 All deiodinases liberate 1 iodine (I-) from T4. Type 2 deiodinase (DOI2) is found throughout various tissues and converts T4 into T3, resulting in the requisite loss of iodine (I-) into the cytoplasm. Type 3 deiodinase (DOI3), also found throughout various tissues, deiodinates T4 but results in inactive metabolites reverse T3 (rT4) or 3,3′-diiodothyronine (T2). Type 1 deiodinase (DOI1) is only found in thyroid, liver, and kidney organs and can either result in active or inactive metabolites.68 Within each cell, the deiodinases act in concert to maintain a specific level of active T3 that is independent of circulating levels of thyroid hormone. For example, in a hypothyroid state, DOI2 will be upregulated to increase the intracellular production of T3 as compensation. Normally, the various deiodinases are balanced to provide the intracellular environment with the proper amounts of T3 and/or iodine.69 However, they can also be manipulated within cancerous cells by the oncogenic processes. For example DOI3 is essential for the proliferation and survival of basal cell carcinoma.70 While speculative, it is possible that reverse T3 production serves as a means of allowing a cell to increase its intracellular pool of iodine without increasing its pool of active T3. 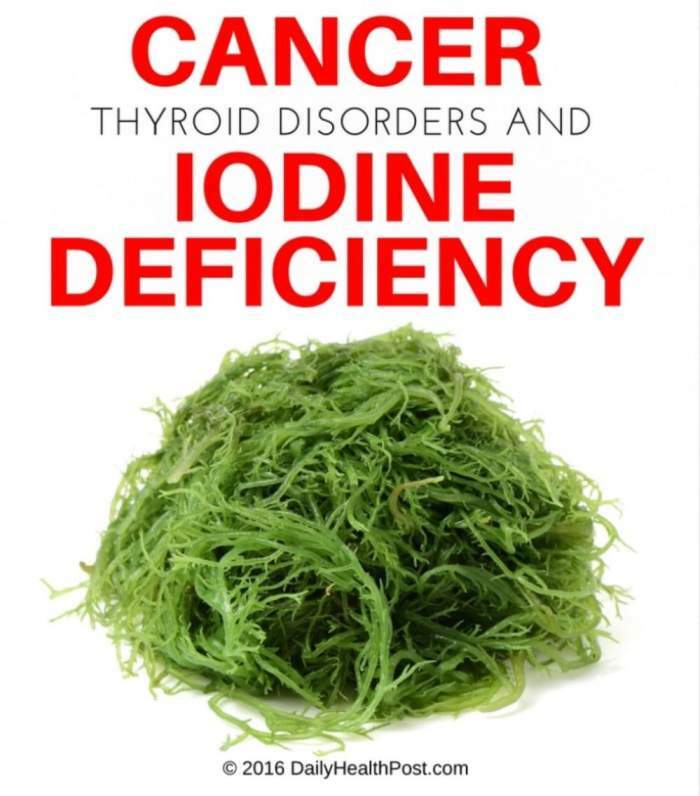 The established consequences of iodine deficiency in population-based studies and the implications of iodine deficiency in the etiology of cancer certainly justify repletion of iodine in all populations through diet and/or supplementation. According to the National Institutes of Health (NIH), adults should consume a minimum of 150 mcg/day of iodine, pregnant women 220 mcg/day, and breastfeeding women 290 mcg/day.71 The safe upper limit of consumption according to the NIH is 1,100 mcg/day for adults, with lesser amounts for teens and children. However, the NIH concedes that higher doses may be necessary for some, explaining "These [upper safe limit] levels do not apply to people who are taking iodine for medical reasons under the care of a doctor." When assessing the physiological effects of ingested iodo-compounds, the form that is consumed is highly relevant. Most pertinent to the nutritional supplementation of iodine compounds is the finding that iodide salts (ie, KI, NaI) affect the thyroid while molecular iodine (I2) has less influence. This is the Wolff-Checkoff effect, which is essentially the shutdown of thyroid hormone synthesis in the presence of large amounts of ioidide (I-). This effect is due to impaired transport of the iodide (I-) molecule, which is the only means for the thyroid to obtain the necessary iodine for thyroid hormone synthesis. While this effect is generally thought to be transient until the thyroid gland reequilibrates to the available iodide, there are also published studies showing a permanent impairment of thyroid function.72�C75 Those most likely to have adverse effects were more likely to be elderly, have severe iodine deficiency, and/or have a larger increase in iodine consumption. While the NIH recommends 1,100 mcg/day as the safe upper limit, doses up to 4.0 mg/100 lb body weight of I2 appears to be both safe and therapeutic for benign breast diseases. The most effective anticarcinogenic form of iodine appears to be molecular iodine and intracellular 6-iodolactone. Doses exceeding 4.0 mg/100 lb of body weight have not been clinically documented as safe. In fact, there is documentation that doses 9 mg and higher may induce transient hypothyroidism as well as minor side effects such as respiratory tract infection, headache, sinusitis, nausea, acne, diarrhea, rash, or abdominal pain.76 These side effects abated with the discontinuance of iodine, but it is important to realize that high-dose iodine is not without risk of side effects. One last cautionary note, even with molecular iodine (I2), is that patients with antithyroid antibodies can have an exacerbation of symptoms with use.81,82 All patients should undergo testing for autoantibodies before beginning any supplementation of iodine. In the benign breast disease studies referred to above, there were no such adverse reactions because women with autoimmune disease were excluded from the study designs. Human data, including epidemiological and histological evidence along with animal and in vitro models, all corroborate the hypothesis that iodine compounds are essential in the health and proper differentiation of tissues. 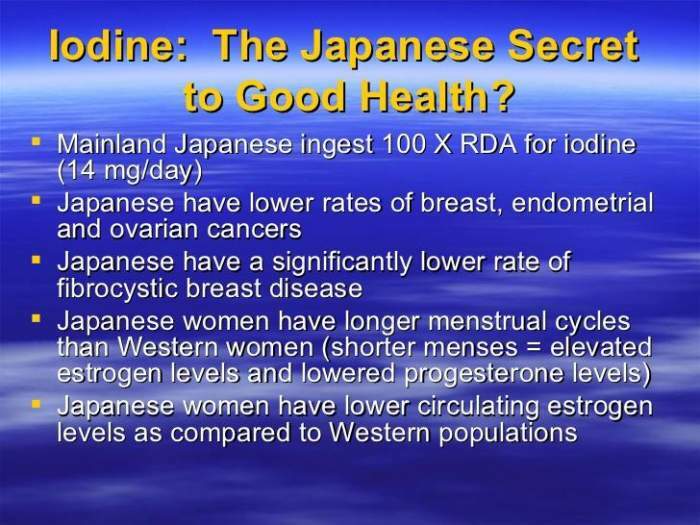 Iodine deficiency may be a hidden risk factor for cancer development and/or progression. The evidence is strongest for stomach cancer, but emerging data indicate that it may also be a risk factor in breast, prostate, and perhaps many other cancer types. There is little risk to adding whole sea vegetables to the diet. For those patients wanting to use high dose iodine therapeutically, it is best done under the guidance of a practitioner who can monitor for any untoward effects.